Oswestry town councillor Paul Milner joined Retail students at Derwen College, in Gobowen, printing a giant ‘Start’ banner for the upcoming Derwen College Sponsored Walk. The councillor and Derwen College governor joined students working in the college’s Karten Print Shop to experience a day in the life of a Learning Support Assistant (LSA). LSAs play a vital role in supporting students with their learning, helping the teaching staff by ensuring that every student can make progress at their own pace and level. As part of his role, he helped students to create the massive banner which marks the beginning of the Sponsored Walk which will be held on 31st March. 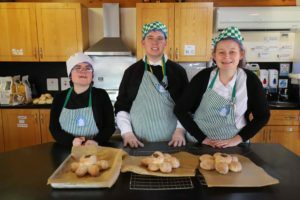 As governor at the college for young adults with learning difficulties and disabilities, Paul is aware of the vocational and independence skills taught at the college but was keen to be more involved at ground level. This wasn’t his first experience volunteering at Derwen College, he has previously worked as ‘LSA for a day’ with the college’s Horticulture students. He said: “I really enjoyed my time helping at Derwen. It was nice to see another aspect of the great work that the college does day to day, and to get to know the students and staff. Learning Support Assistants (LSAs) and teachers do such a great job working with and supporting the students. “It was also great to talk to students about their experience at the college and see how well they worked together as a team,” he added. Paul was keen to help create the banners for the college’s Sponsored Walk and Fun Run on 31st March. He will be working as volunteer marshal on the day, cheering on and directing walkers and runners. 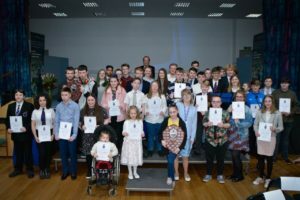 The 10k walk, starting and finishing at Derwen College in Gobowen is a popular walk with students and their families as well as the local community. And for the first time this year, there will be the option to run the 10k route. To register to walk or run, volunteer as a marshal or to sponsor a student email [email protected] or telephone 01691 661. Find out more about volunteer opportunities at Derwen College. 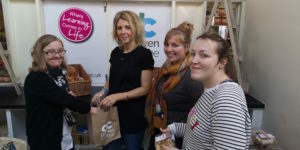 Retail students Megan Allmark and Bethany Higton, and learning support assistant Amy Woosnam welcome Mel Jones, their first customer at Wrexham Butcher’s Market. Derwen College students were pleased to welcome their first customer to a new shop unit at Wrexham Butcher’s Market. Students from the specialist residential college in Gobowen launched the Derwen College shop in the town centre market this week. They were delighted to welcome shopper Mel Jones as their first consumer through the door. The new Derwen College shop will be open every Monday and Friday. It will be staffed by Retail students and supporting staff, sells hand-made bread, cakes, jams, chutneys, gifts and crafts made by the college’s Hospitality and Creative Arts students. Additionally, it will stock a range of plants from the college’s Garden Centre and screen-printed greetings cards designed and created by students at the college. The shop also serves as a showcase for student-led upcycling business Hwre which is based at Derwen College satellite site Ashdale House, near Wrexham. Students at the site near Wrexham produce upcycled crafts, furniture and gifts as part of their learning and work placements. Derwen College Commercial Development Manager Pete Evans said he was pleased to launch the new shop to sell the college’s [email protected] range and provide work placement opportunities for students. Retail students also have a stall at Oswestry Market every Wednesday and Llangollen Market every Tuesday. Maisie, Bethan and Carter were amongst the young people nominated for the High Sheriff’s Award. Three Derwen College students were nominated for young citizenship awards for their outstanding contribution to college and community. The students were nominated for The High Sheriff of Shropshire’s Outstanding Young Citizenship Award and were invited to attend a ceremony with the county’s High Sheriff Rhoddy Swire. Students Bethan Charles, Maisie Thomson and Carter Gough were put forward for the award for embracing opportunities while at the college. The trio have gone above and beyond in their efforts at college: Bethan has represented Derwen College through her work with Student Union Board and National Union of Students; Maisie has challenged herself through Duke of Edinburgh’s Awards; and Carter has pushed himself through competing in table laying at high-pressure national skills shows. Derwen College Principal Meryl Green said she was delighted with the recognition for the students. 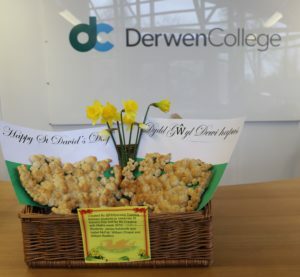 Derwen College students, who hail from all over the UK, embraced St David’s Day on 1st March, using the Welsh patron saint as inspiration across the college’s pathway areas. Hospitality students Megan Sheppard, Carter Gough and Grace Bennett combined celebrations for St David’s Day and Real Bread Week by making daffodil-shaped breads as part of their learning in the Training Kitchen. 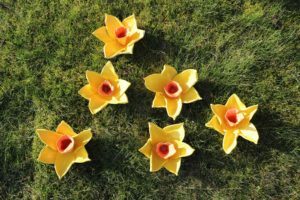 The college’s Creative Arts students created beautiful ceramic daffodils to sell to customers in the Garden Centre shop. 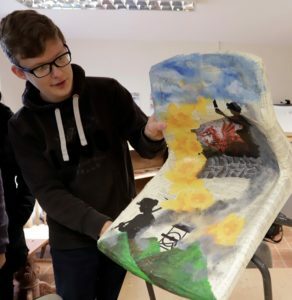 Students working at Derwen College’s Ashdale House satellite site near Penley, Wrexham, designed and produced upcycled furniture inspired by Wales as part of their upcycling enterprise Hwre. They transformed a bookcase using decoupage images from Welsh song Calon Lan (meaning Pure Heart); and Louis Thomas designed a chair using images of a Welsh coal mine, daffodil and dragon. Hospitality and Housekeeping students also excelled themselves in producing bread Welsh dragons in the Training Kitchen. The team managed to mark St David’s Day, Real Bread Week and Maths Week in one fabulous project. Derwen College Principal Meryl Green congratulates long-serving staff Dee Mitchell, Kerrie Price and Sam Brown. Six members of Derwen College staff have clocked up a total of 70 years work between them this term. We are pleased to congratulate these dedicated employees, who work across different areas of the college, and all receive long service recognition this spring term. 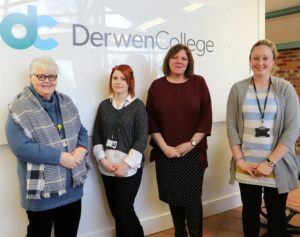 Sam Brown, Quality Manager; Sophie McCulloch, Care Support Worker; Abi Baker, Work Experience Co-ordinator; Kerrie Price, Supervisor; and Jade Harris, Support Practitioner/Coach are all marking a decade working at the college, while student counsellor Deidre Mitchell has been at the college for 20 years. At Derwen College we hope to offer opportunities for staff to expand their knowledge and expertise through training and work. Work Experience Co-ordinator Abi Baker started in 2009 as a Learning Support Assistant (LSA). She said: “I have really enjoyed my 10 years working at Derwen College. I began my time here in the Hospitality department as an LSA supporting students in the restaurant, meeting rooms and housekeeping areas. I then undertook my teaching and Special Educational Needs (SEN) qualifications which were a difficult challenge for me. From there, I moved over to the external work experience area where I took students out to work at various locations. Since then I have progressed to Work Experience Coordinator and now manage a small team of brilliant job coaches and arrange students external work experience placements linked to their vocational training. Derwen College Principal Meryl Green thanked the staff for their commitment to the college. To find out more about working at Derwen College click here. Retail pathway lead Sioned Davies, retail students Thomas Alexander and Sian Walker, and Spar owner and Industry Champion Mark Prust. 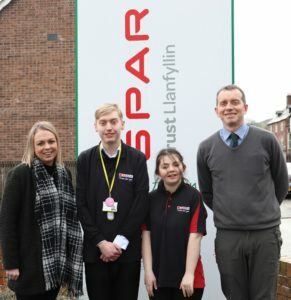 Thomas and Sian enjoy weekly work placements at Spar in Llanfyllin. Llanfyllin Spar owner Mark Prust has agreed to share his experience and knowledge in retail to become an ‘Industry Champion’ for Derwen College, near Oswestry. The owner of the second-generation business, which was established in 1975, was delighted to volunteer as an Industry Champion, supporting retail staff and students. Two retail students from Derwen College, in Gobowen, travel to Spar every Tuesday morning for external work placements. In his new role, Mark will also be keeping the college up-to-date on the latest technologies, training and best practice. Mark said he was very pleased to support the college in any way he was able. “I was surprised but pleased to be asked to contribute my retail experience to enhance the work done at Derwen College. I hope to be as pro-active as possible in helping out with discovering and understanding latest innovations,” he said. “At Spar we are continuously looking at the latest technology and training for till systems, stock-taking and health and safety which is information that we can share with college staff and students. Retail students Thomas Alexander and Sian Walker work at the Spar every Tuesday taking on roles such as stacking shelves, checking stock and customer service. They both enjoy their time working at Spar with Sian particularly relishing conversing with staff and customers in her native Welsh language. Retail Studies Pathway Lead Sioned Davies said it was wonderful to have Mark on board as an industry champion.